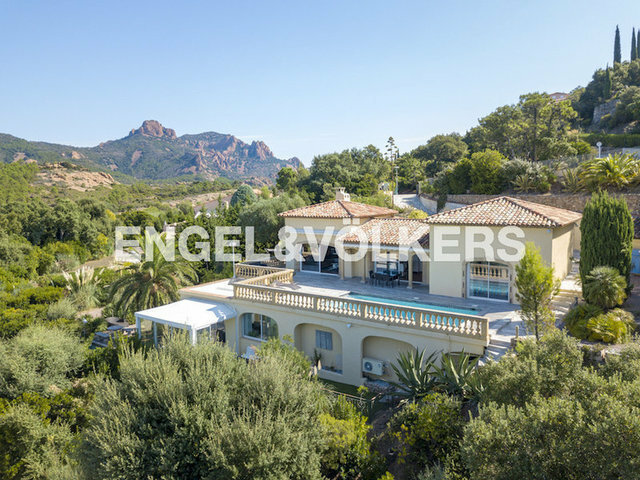 Located in the most prestigious gated domain of Agay, this wonderful villa of 286 sqm offers panoramic views of the bay of Agay and on the Cap Dramont, with the gulf of Saint Tropez and the mountains as a background. The villa is composed of a large living area with high ceilings opening onto a terrace with swimming pool, 4 bedrooms, 3 bathrooms, 2 kitchens (one on each level), a home cinema and a veranda with Jacuzzi that can be completely opened. A second independent access enables guests to enter the house without disturbing each other. The quietness and Mediterranean surroundings are an invitation to relaxation and sharing precious moments with family and friends.